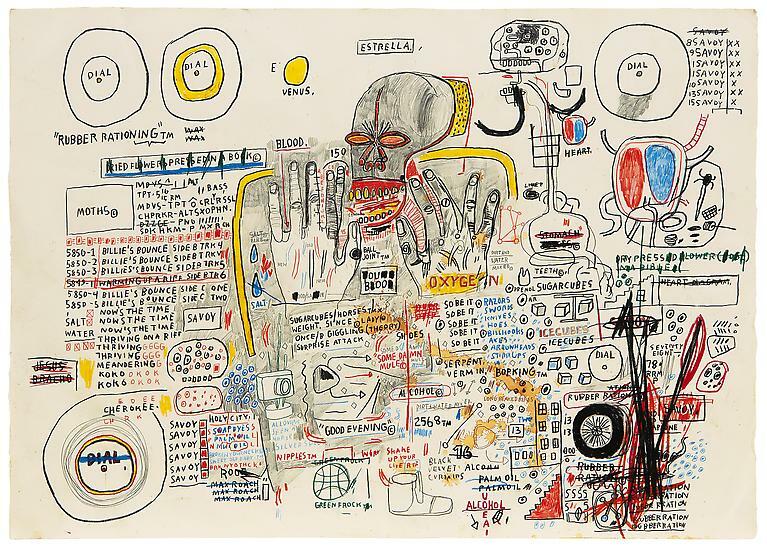 Now through June 13, the Acquavella Gallery is hosting an exhibition entirely dedicated to Jean-Michel Basquiat’s works on paper. 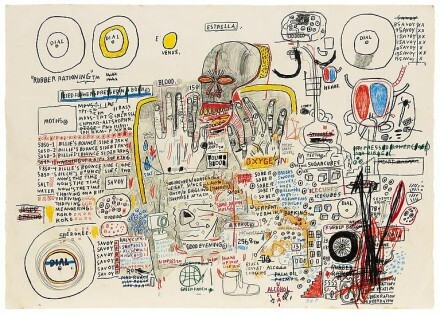 The show, curated by Fred Hoffman, includes 22 drawings and one painting from the collection of Herbert and Lenore Schorr, a pair of Basquiat’s earliest collectors and friends, and dedicated predominantly to the artist’s works on paper, revealing a range and complexity few associate with Basquiat’s work. Basquiat is most typically associated with a bold use of saturated color and text displayed on large-scale, crowded canvasses, and his characteristic use of text in his paintings and drawings aligns the artist with the history of the Black Arts Movement that he succeeds by 20 years. 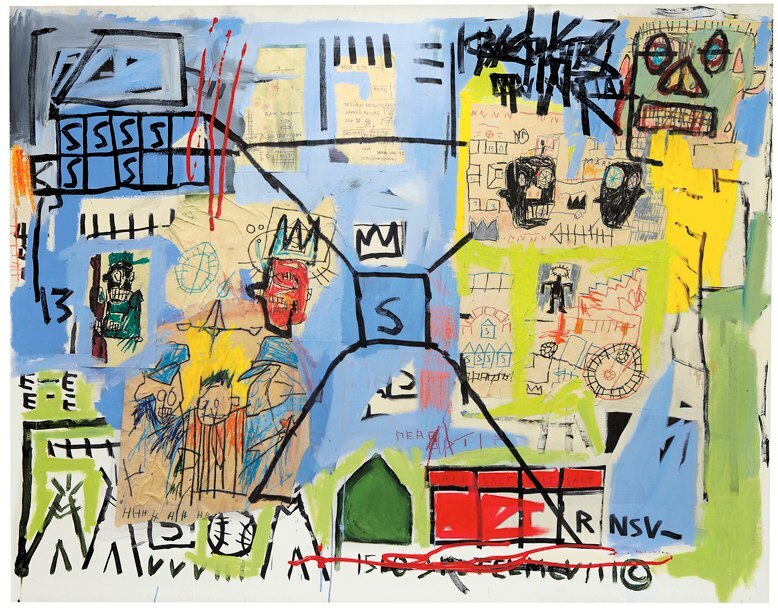 Like the BAM, the themes and content of Basquiat’s work speak directly to repressive power structures and social failings. Also frequently cited in this work is a prevailing abstraction that speaks to the alienation and intense existential angst of living in the world under repressive circumstances. While the Black Arts Movement was founded on principles of solidarity and militancy, Basquiat examines the deeper truths of the individual struggle. Marrying text and image, his drawings expand upon this critical reflection on the power structures that condition and limit the circulation of art and the individual. The Schorr Family collection includes a number of work previously unseen by the public. 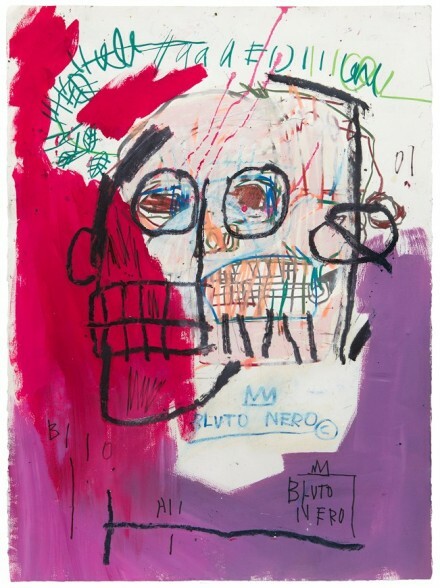 Their collection and friendship with the artist was marked by a particular interest in the works on paper that were disregarded by many other collectors at the time, and the resulting collection offers a unique expansion on Basquiat’s work and practice. Untitled (Estrella), for instance, overflows with symbolism and text that suggests a torturous relationship between the individual and the physical and social conditions of existence. Privileging text and line over saturated color, the work floats a grinning skull at the center, surrounded by a confusion of scratched out words and names. Song titles and the name of jazz musician Billie Roach are organized in a sloping line down the left side of the paper. In the words “blood,” “sugar,” and “alcohol” scattered throughout this piece there is a logic as complex and exact as the movement of these chemicals through the human body. 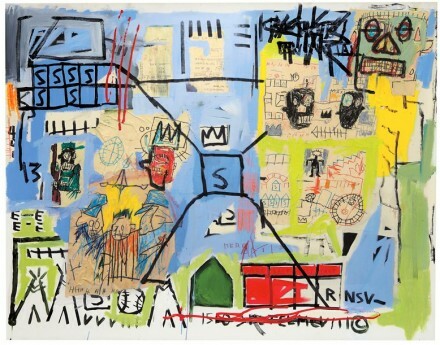 This piece is exemplary of the precision with which the social critique of Basquiat’s work is mobilized. 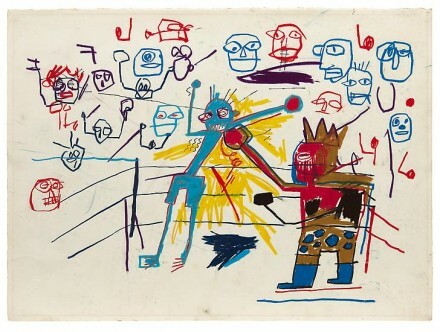 Basquiat, Untitled (Boxing Ring) 1981. 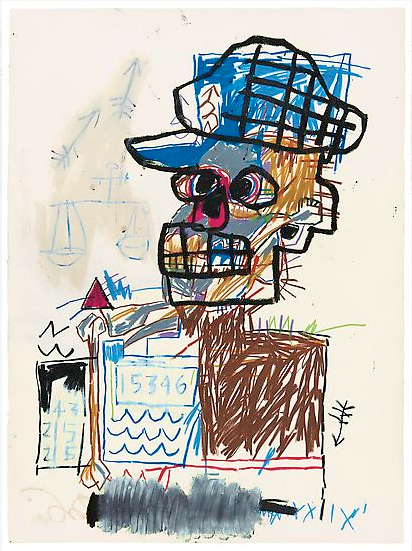 The Schorr Family Collection, Art © The Estate of Jean-Michel Basquiat / ADAGP, Paris / ARS, New York 2014. This work from the Schorr Family Collection reveals to the public a dimension of Basquiat that transcends the abstract, neo-expressionist label often applied to the artist. Drawings such as Untitled (Scales of Justice) 1982 speak directly to the power systems and societal problems that concerned the artist. Pulling from the legacy of the Black Arts Movement, these works channel a very direct and calculated anger, expanding upon the significant politics of this work that is so frequently dismissed as abstract alienation. Basquiat, Jean-Michel. Untitled (Scales of Justice) 1982. 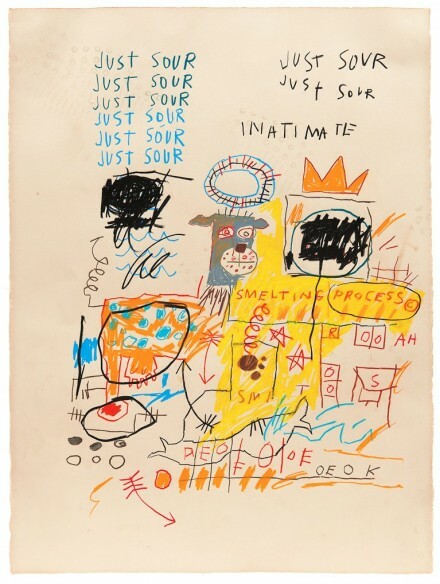 The Schorr Family Collection, Art Ⓒ The Estate of Jean-Michel Basquiat / ADAGP, Paris / ARS, New York 2014. 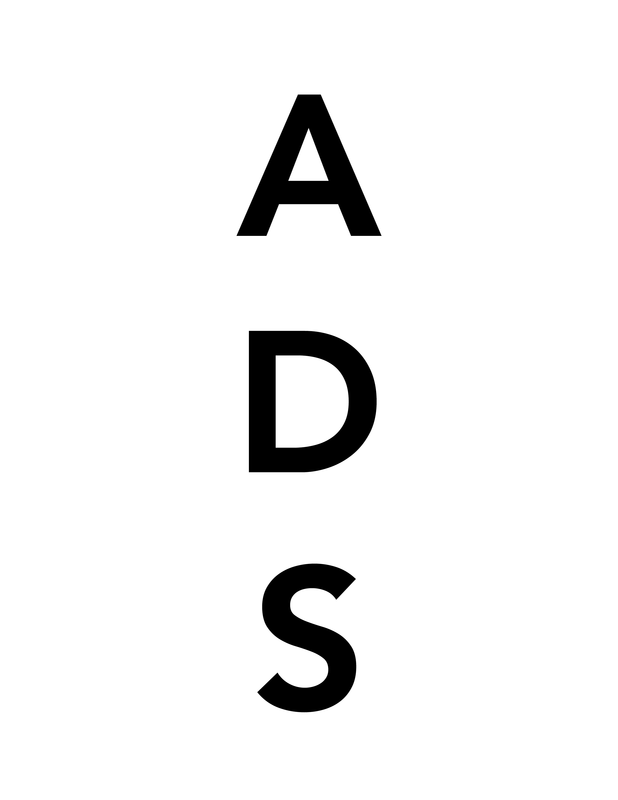 This entry was posted on Tuesday, June 10th, 2014 at 4:08 pm	and is filed under Art News. You can follow any responses to this entry through the RSS 2.0 feed. You can leave a response, or trackback from your own site.